The only thing that I more prefer using Paypal is it accepts a wider variety of payment methods through credit cards and debit cards, payments deducted from bank accounts. Google Checkout, on the other hand, only accepts credit cards or debit cards. So, basically both allow customers to create free personal accounts and store their credit card or account numbers on their Google Checkout or PayPal accounts so that their bank information will not be exposed during a transaction. Besides that, both Paypal and Google Checkout also offer security but Paypal provides a phone number where one can call, however Google Checkout can only be reached through email and forums. The ability to send and receive money online using your email address is not yet available on Google Checkout. With PayPal, you can receive money in about 50 countries, while Checkout accepts U.S. and U.K. merchants only. And while PayPal is offered in 17 currencies, while Checkout deals only with dollars and pounds. In a nutshell, Google Checkout‘s key benefit over PayPal is the ability for merchants to use Google AdWords, which is a way for the merchant site to attract more relevant Google ads and thus reduce their cost of advertising. 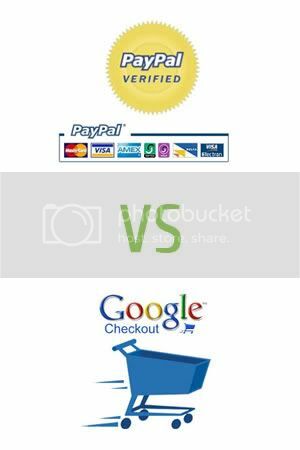 PayPal’s key benefit over Google Checkout is that it is more widely used and offers more payment options to users. This entry was posted on Saturday, July 10th, 2010 at 9:03 am	and is filed under Online Payment Option, Paypal. You can follow any responses to this entry through the RSS 2.0 feed. You can skip to the end and leave a response. Pinging is currently not allowed.